Whilst the majority of UK homeowners can simply hook up to mains gas to fuel their central heating systems, the rest of us are left to seek out other options. If you’re off the main grid, a popular choice of fuel is liquid petroleum gas (LPG), especially since it can be used within a conventional gas central heating system. The main difference between LPG gas central heating and mains gas is the fact you need to have your fuel delivered and stored at your property. It’s transported via a truck and transferred to your own personal supply tank. Homeowners then pay an annual service charge to LPG suppliers to let them use their tanks. Installing LPG home heating has a unique set of pros and cons. Before going ahead, you must understand the general process and costs involved. Usually, your LPG supplier will not fit gas boilers themselves, although they can recommend a gas certified professional who will. They will arrange for delivery of your own external supply tank once you have agreed to use them. It can be positioned above or below ground depending on your available land and preference. They will also install the required pipework and vessels linking the tank to your home. Once inside the property, the supply will still need to be linked to a gas boiler and heating system. This is not a DIY job, it’s only suitable for trained Certified Gas Safe LPG Engineers. You can find these tradesmen and get quotes from Quotatis. Tankers can be dispatched to refill your supply as required. Most suppliers can usually deliver within 10 days notice. Emergency refills are available but you will face additional charges of up to £300. It’s recommended to request refills once your fuel gauge reads between 20-30% full. Whilst mains gas is certainly the cheapest of the three, it’s simply not an option in this case. But if we compare LPG to electric heating systems the savings are substantial. Replacing an older gas boiler with a modern efficient model will cost between £1,600-£2,000. New radiators can also be supplied and fitted for £180 each. Use LPGUK help you find local LPG suppliers. Many will even fit your external tank in the garden free of charge. But you will have to pay a standing charge or “tank rental”. This price varies between suppliers but you can expect to pay around £65 annually. For an underground tank buried in your garden, you will pay additional charges for installation up to £1500. The standing charge will also rise to around £130 annually. What Are The Advantages to LPG Gas Heating? “Cleaner” Fuel. When LPG is compared directly with other fossil fuels, oil and coal, it’s a far cleaner option. Burning produces less sulphur, nitrogen oxides, carbon dioxide and soot. Even if the fuel is “spilled” it will not contaminate the ground or water. Convenience. You can use conventional gas central heating systems. The heat produced is very controllable similar to mains gas. It’s quiet and doesn’t produce any strange smells. When compared to using burning oil, the boilers are smaller, cheaper and don’t require as much maintenance. Competitive Costs. With LPG systems, you do not have to purchase your supply tanks, plus the cost for installation is far lower than a heating oil system. Switching between LPG suppliers is also easy, allowing you to compare prices and stay with cheap suppliers. Great Efficiency. One of the key reasons for LPG’s popularity is the efficiency. Modern gas boilers are very efficient. This has been achieved by using hot flue gases that were previously discarded. LPG is flexible fuel source and an ideal choice for many who live off the gas grid. It’s not so different from natural gas in characteristics, ease of control and instant heat. Delivery. Since your tank will hold your only supply, you need to get it refilled before it runs out. You must ensure you use monitoring systems and have enough fuel to make it until the next delivery. Automatic monitoring and delivery requests are available on some systems. You should allow at least 10-days for delivery to avoid issues. Storage Tank. 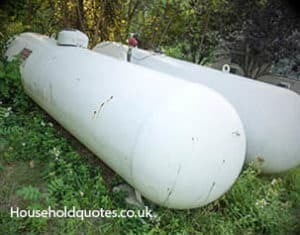 You will need to find somewhere suitable to place a large LPG storage tank. They can be unsightly but you can always go with an underground tank. To ensure your boiler is running at maximum efficiency, your system will require annual servicing. Your supplier will also need to check and maintain your tank periodically. Also, remember that LPG is still a fossil fuel. It’s a non-renewable energy source that releases carbon dioxide and other harmful gases. If you’re off the main grid and need an alternative fuel source, LPG is a great way to heat your home. It beats burning oil by a long shot. It’s going to be more costly than conventional gas but still far cheaper than running on electricity. If you’re interested using renewable energy based central heating, check out the Renewable Heat Incentive and find out if you could run on your own steam.